I read this book after seeing that it was the next read in the Words for Worms book club and realizing it was only $1.99 for my Nook. It was CLEARLY meant to be. Brings me back to Juliet saying that books always find their perfect readers in The Guernsey Literary and Potato Peel Pie Society. But that’s (literally) a different story. Anyway. The Rosie Project is the (absolutely charming and hilarious) story of a genetics professor, Don Tillman, who is on a quest to find the perfect woman. But Don has some personality quirks of his own that lead to some difficulties. Don is different than most people: socially challenged with almost an autistic-like quality to him, something he doesn’t realize even after giving an entire lecture on the topic. Helping Don on his search for the perfect woman are his two friends Gene and Claudia, a married couple with more than a few of their own problems to resolve. Don creates an extensive questionnaire in order to rule out people he would deem unsuitable; smokers, people who are chronically late, and excessive drinkers need not apply. Enter Rosie Jarman. A sarcastic, loud, smoker who works part time as a bartender. Someone who is of course completely unsuitable in Don’s eyes. It is purely by coincidence that Rosie walks into Don’s office amid his search for love, and the two become the most unlikely friends. When Don learns about Rosie’s own project to discover who her biological father is, he is excited to help, and before he knows it, breaking all of the stringent rules he had previously set for himself. 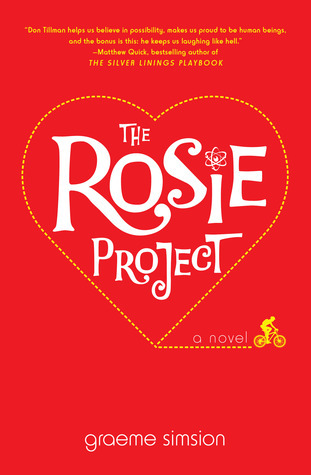 The Rosie Project was originally written with the intention of being a screen play, and though I absolutely adored the book, I would love just as much to see it turned into a movie eventually. I could picture all of Don’s antics so perfectly, and I just loved Rosie and her sarcasm and feminism so much. 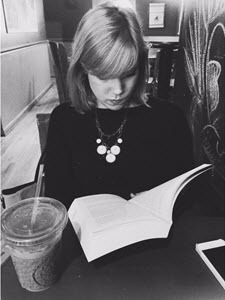 This is a really quick, fun read that shows that you can’t define the perfect person on paper, because people never cease to surprise you. I easily give this book five stars, and can’t wait for the forthcoming sequel! Ahhhh this is so awesome! I haven’t started it yet and now I’m EVEN MORE EXCITED!